FIGURE 2-4 Structural consequences resulting from the reduction of pregnan-3-one. The orientations of a- and /3-hydroxyls of compounds 20 and 21 as equatorial (e) or axial (a) substituents, respectively, on the chair version of the A rings are shown in the bottom row. As indicated, the B and C rings of both cholestane and coprostane are locked into chair conformations (see Figure 2-5). Although, in principle, the A ring of both these steroids is free to interchange between the boat and chair representations, the chair form is believed to be much more favored. In the case of vitamin D steroids, which do not have an intact B ring due to the breakage of the carbon-9-carbon-10 bond (they are termed seco steroids), the A ring is much more conformationally mobile than that of the usual cholesterol-derived steroids (see Figure 9-7). An important point for the reader to consider is that the usual structural representation given for steroids (e.g., see Figures 2-2, 2-3, and 2-4) provides no clear designation of either the three-dimensional geometry or the space-filling aspects of the electron orbitals associated with each atom involved in the formation of the requisite bonds. A comparison for cholestanol is given in Figure 2-10 of the planar representation (A), the planar conformational model (B), a Dreiding three-dimensional model emphasizing bond angles (C), and a Corey-Pauling three-dimensional space-filling model (D). Certainly the space-filling molecular representation most closely approximates the reality of the biologically relevant form of the steroid. The approach of steroid conformational analysis has been of great value to the organic chemist as a tool to predict or understand the course of synthetic organic chemical reactions. It is also to be expected that conformational considerations will play an increasingly useful role in the understanding of steroid hormone-receptor interactions. Steroid receptors are known to have very high ligand specificities; see for example, Table 9-4, which illustrates the structural preferences of the nuclear receptor for la,25(OH)2D3. It would be surprising, therefore, if the intimate local structure of the receptor's ligand-binding site did not have the capability of distinguishing and discriminating between the various conformational forms of the same steroid hormone. (37) is a commonly employed antiinflammatory steroid. The presently employed orally active contraceptive steroids do not contain any naturally occurring estrogens or progestins. The structure of the abortion-inducing drug RU-486, also known as mifepristone, is shown (41); it is structurally related to progesterone (12). Two major classes of synthetic progestins are employed: (i) derivatives of 19-nortestosterone, such as norethindrone (42) or norethynodrel (43), and (ii) derivatives of 17a-acetoxyprogesterone such as medroxyprogesterone acetate (44). These progestins are administered in combination with varying doses of two synthetic estrogens, either ethinylestradiol or ethinylestradiol 3-methyl ether (45). Each of these compounds has an ethinyl group on carbon-17, which enhances their oral activity. 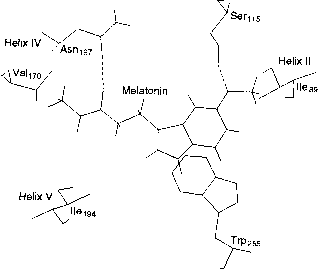 The bile acid structures in Figure 2-11 are those of the principal forms present in humans.